Ha. There must be quite a few forest notices/posters that fit the bill. Alex, this is your moment to shine! 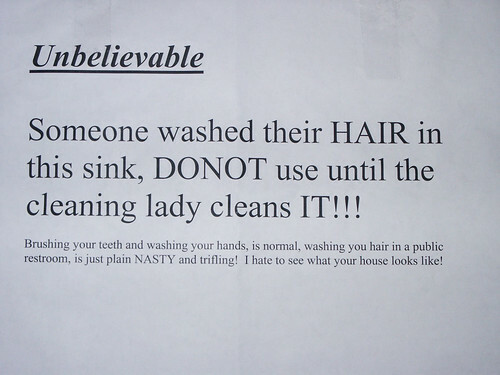 for the record: i do not think it is nasty to wash your hair in a public sink. i once worked in an office where one guy would not actually talk to me if i wasn't wearing shoes. I wonder who felt obliged to add a NO to the sign. Do they have a deficient sarcasm gene, or am I the one missing something?